A fantasy drama series by Malcolm McKay, adapted from The Gormenghast Trilogy by Mervyn Peake, and first broadcast on 17 January 2000 (BBC2). Gormenghast is a television epic, adapted from the cult novels of Mervyn Peake. The Groan family have reigned over the strange land of Gormenghast for centuries. The royal household's aversion to change and reliance on tradition, however, threaten to cripple this once-mighty kingdom. When a ruthless servant, Steerpike, determines to exploit the Groans' weaknesses, the overthrow of Gormenghast seems certain. 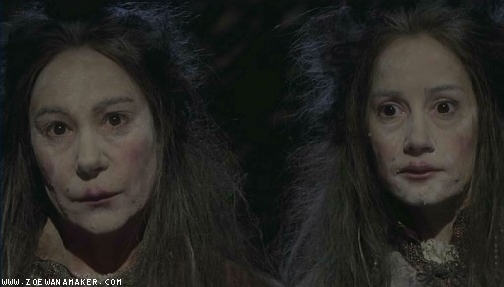 Among the palace's residents are identical twins Clarice and Cora Groan, who have been barred from public life for over a decade. Shunned by their relatives, the resentful sisters develop a thirst for power at any cost and are among the first to be corrupted by Steerpike. Having failed to guess the real motivation behind the kitchen boy's plans, the simple-minded pair are persuaded to set fire to the palace's ancient library. Lord Groan is driven mad by the loss of his beloved books. Steerpike rewards his co-conspirators only by locking them away, without hope of escape. His rise to power seems unstoppable. Only the young heir, Titus Groan, stands in his way.